With Love From Rachel: why just eat food when you can eat attractive food? why just eat food when you can eat attractive food? The Caprese salad (salad in the style of Capri, an Italian island - fancy, I know) is my all-time favorite salad. This is a big deal due to the fact that the majority of my food intake is salad. ﻿That means it really had to compete for my attention. You do incorporate bread into this meal - or at least I do, so it did not have to compete all that hard, realistically speaking. Above is my version, which incorporates all major food groups (most all) including: vegg, cheese, bread. You cannot see the bread in this image, but trust me, it was crusty and I ate a loaf of it. There are a lot of recipes for this salad online, but I have made this so often I think I have it down, so I thought that I would share. Throw a few heirloom tomatoes in the mix. The salad doesn't have to be totally heirloom (that could get expensive) but a few makes the dish even more attractive and they are DELICIOUS. I buy them at our weekend farmer's market. I always reduce 1/2 cup of balsamic down to a few tablespoons so that it thick, making it less likely to sink into the mozzarella, making it look icky. This is very easy - just put balsamic on the stove, bring to a boil (this will happen very quickly because of balsamic's sugar content) and then reduce heat and let simmer for around 5 minutes. Season each tomato with salt and pepper as if you were seasoning a steak. Why should only half the tomatoes be yummy? Individually sprinkle those babies as if you were personally going to eat each and every one of them. Because you just might. Don't forget the bread. 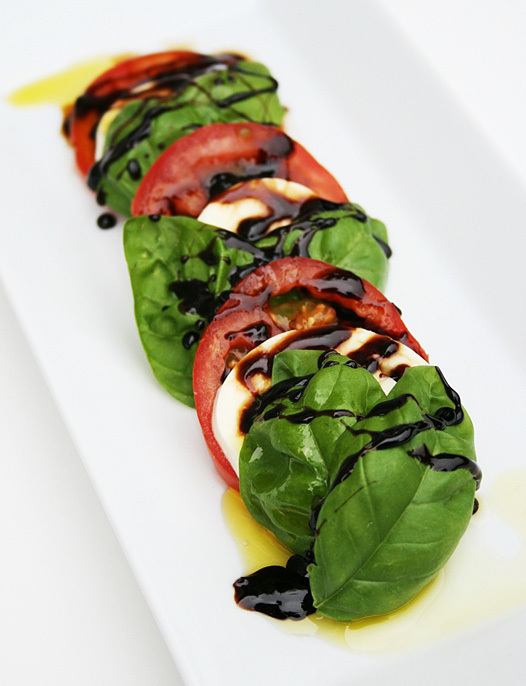 Caprese salads should be served with a large quantity of bread that is crusty on the outside but soft enough inside to absorb the fabulous balsamic reduction that you sweated over a stove for almost 7 minutes for. I can appreciate the aesthetics of food, so long as the flavour & texture is on point. These salads look lovely AND delicious! Thank you for the comment! It is a simple salad to make and very tasty.